A New Map of the East Indies, Taken from Mr. de Fer's Map of Asia, Shewing their Chief Divisions, Cities, Towns, Ports, Rivers, Mountains etc. 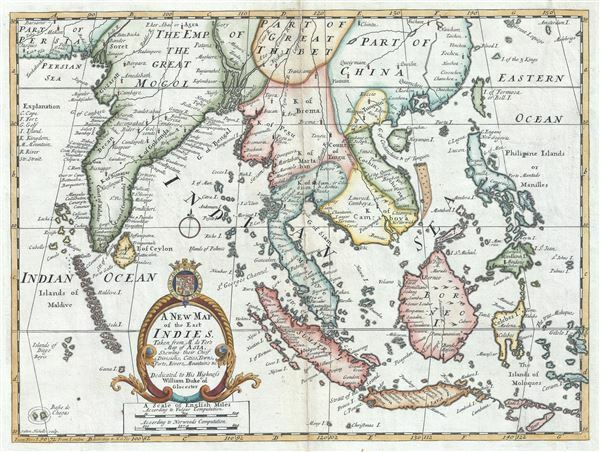 This is an attractive and scarce 1712 map of India and the East Indies by Edward Wells of Oxford. Centered on Malaysia, this beautiful map covers all of Southeast Asia from Persia to the Timor Island, inclusive of the modern day nations of India, Ceylon, Thailand, Burma (Myanmar), Malaysia, Cambodia, Vietnam, Laos, Indonesia, Borneo, and the Philippines. Based on Nicholas De Fer's map of Asia, the map renders the region in detail offering both topographical and political information with mountains beautifully rendered in profile. The Island of Singapore is shown but not labeled. Bali (Baly) and Lombok (Lombock) as well as Batavia are identified. Most of the Great Sunda Islands as well as the Lesser Sunda Islands, which were largely unexplored well into the 19th century, are mapped speculatively. Depicts a fairly narrow India and a misshaped Taiwan. A large title cartouche is included in the bottom of the map featuring the coat of arms of the Duke of Gloucester. This, like many other Wells maps, is dedicated to Prince William, Duke of Gloucester and son of Queen Anne, who, when this map was being prepared, was a student at Oxford. Engraved by Sutton Nicholls and published by T. Bonwicke for the 1712 edition of Edward Wells' Atlas, A New Sett of Maps both of Ancient and Present Geography.